After nearly 40 years of riding across millions of American TV and movie screens, the cowboy actor William Boyd, best known for his role as Hopalong Cassidy, dies on this day in 1972 at the age of 77. In tribute here’s a flash look back at Boyd and the iconic Hopalong Cassidy. William Boyd became the first cowboy actor to make the transition from movies to Television with the premiere of the “Hopalong Cassidy” TV series in 1949. Despite the fact that the networks wanted little to do with what they thought was a fading genre “Hopalong” became the seventh most popular show on TV and merchandise based on the characters and show sold like hotcakes. The program would also usher in a long array of Western shows that audiences loved. Boyd and Hopalong were so popular that there was even an amusement park, Hoppyland named for the character, which opened on May 26, 1951 in Venice, California. Hopalong Cassidy was created in 1904 by Clarence E. Mulford, who wrote a series of popular short stories and many novels based on the character. Those resulted in more than 60 popular “B” Westerns produced independently and distributed by the studios throughout the 1930s and 1940s. In all media incarnations Hopalong along with his loyal horse, Topper righted wrongs, fought against evil and saved innocents from distress. No tribute would be complete without some old-time radio shows (if I can help it). Hopalong Cassidy began his radio career as a regular player when the Mutual Broadcasting System began broadcasting a radio version of “Hopalong Cassidy” in January 1950; at the end of September, the show moved to CBS Radio, where it ran into 1952. Enjoy the following programs starring the most famous hero of them all and his entertaining side-kick, California played by Andy Clyde. I post this as a basic shout out to an American icon and the talent who brought him to life. But the complete story behind how Boyd and Hoppy came to be beloved figures in media is an interesting one so I strongly recommend you visit the Radio Spirits blog for the complete, darn tootin’ story. One of my most treasured western movie collection pieces is a poster of Hopalong Cassidy by Laguna Beach artist, Ivan Anderson. Commissioned for a film festival in November, 1976, the event celebrated the long film career of Hoppy. My limited “Celebrity Edition” is signed by several special guests who were in attendace that day on the premises of Laguna Beach Hospital of which William and Grace Boyd were long time benefactors. Signees included Ronald Reagan and Nancy Reagan, Roy Rogers and Dale Evans, John Wayne, Randolph (Randy) Scott, Gene Autry, Dale Robertson, Andy Devine, Ken Curtis, Rand “Lucky” Brooks, Russell “Lucky” Hayden, Don Haggerty, Denver Pyle, Jan Clayton, Steffi O’Keefe, Jack Elam, Ivan Anderson, and Grace Boyd (Mrs. Hopalong Cassidy). It has been a permanent treasure in our bedroom for almost 39 years. He still looks the same as the day my wife brought him home as a “once in a lifetime” surprise gift for her husband. Call me “Lucky” too. This is awesome – my husband recently picked up a discounted DVD of 5 William Boyed/Hopalong Cassidy films. I had intentions of watching it “sometime”, but your post has prompted me to watch it much sooner. Thanks! Aurora, I absolutely love this post! Thank you for including the radio plays and I really need that vintage lunchbox. Fabulous! Thanks so much. Hoppy and me is pals from way back. I’m waiting and hoping for the time he gets the Saturday morning treatment from TCM. I used to kvetch to them about it, but it went nowhere. 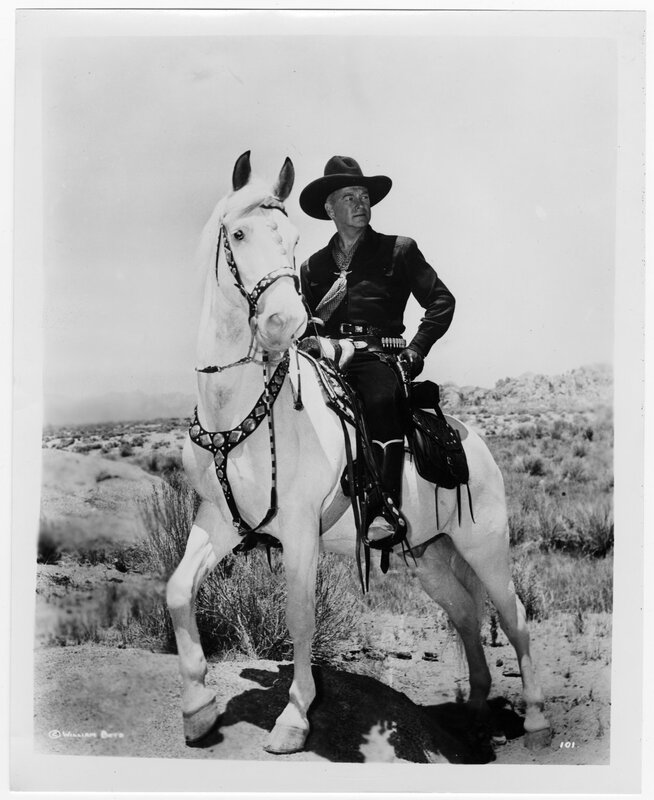 Many of us learned so much from Hopalong Cassidy — including respect, manners, and in general, the importance of doing what is right.. My husband was one who strove hard to live those values every day of his life. Unfortunately after nearly 40 years of marriage, John passed away in early 2014. In a need to go back to a happy time in my life — which included watching Hoppy on TV Saturday mornings “way back then” — I purchased all 66 Hoppy movies and the set of Hoppy programs made for TV. Do I feel better? Yes! When the snow fell swiftly and heavily on many days this past winter, I sat watching episode after episode of Hopalong Cassidy riding Topper and doing all those “good things”. With the help of family, friends, 40 good years of memories with my husband and all those great Hopalong Cassidy programs, I’m back to my old self. I’m also a Hoppy fan again and enjoy reading anything and everything about William Boyd/Hopalong Cassidy. I was so happy to come across this very recent post of yours and to know that Hoppy’s memory is alive and well. Thank you so much!